Kentucky statutes define a SRO as a sworn law enforcement officer who has specialized training to work with youth at a school site. These SROs serve in a variety of roles, including law enforcement officer, law-related educator, problem-solver, and community liaison. There are approximately 230 SRO's in over half of Kentucky's counties. For more information contact Lee Ann Morrison at the Kentucky Center for School Safety. 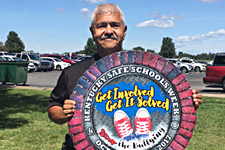 Deputy Glenn Woodard organized the signing of the Kentucky Safe Schools Week Proclamation in Warren County. 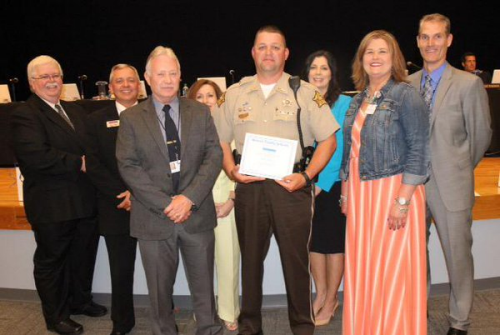 Deputy Sheriff Mike Lucas in Henry County was instrumental in their school districts' taking the online STOP! 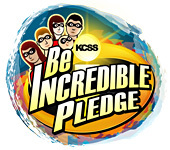 Bullying, Violence and Risky Behavior Pledge. 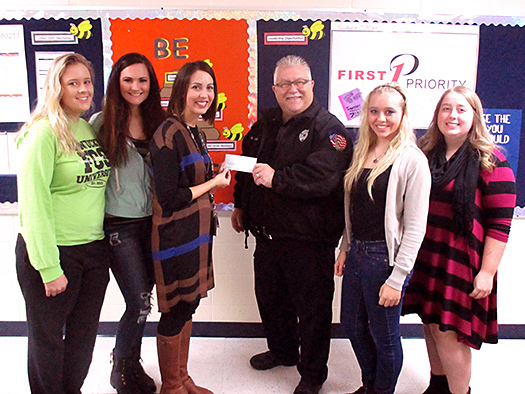 SRO Bill Eckler of Madison Southern High School in Berea, KY. had the opportunity to present a $100.00 check from the Kentucky Association of School Resource Officers to, teacher, Emily Alexander and some students from her Family and Consumer Sciences Class. They are working to raise money to support their Santa’s Workshop Fundraiser and in turn, purchasing Christmas gifts for local needy children. Mrs. Alexander and her students have been very busy preparing and selling breakfast to the staff at Madison Southern as they raise money for this very good cause. The Kentucky Association of School Resource Officers (KYASRO) 2015 awards. The Kentucky Association of School Resource Officers (KYASRO) 2014 awards. Kentucky School Resource Officer of the Year – Officer Sam Wade, Nicholasville Police Department/Jessamine County Schools. This award is given to a school resource officer who has served as a strong role model and has provided services to their schools and communities above and beyond what is expected in their position. Rookie of the Year – Deputy Scott West, Pulaski County Sheriff’s Department/Pulaski County Schools. This award is given to an SRO who is new in the role of law enforcement within a school environment but has made a positive impact on their school community. KYASRO Award of Merit – Jim McKinney, the Kentucky Department of Criminal Justice Training (DOCJT). This special award given by KYASRO is to honor an individual’s efforts in the area of school safety. The KYASRO association would like to extend their appreciation to all the award winners for their efforts in keeping Kentucky’s students safe. The December 2015 Newsletter is now available online. The current SRO Annual Report was published in May, 2016. 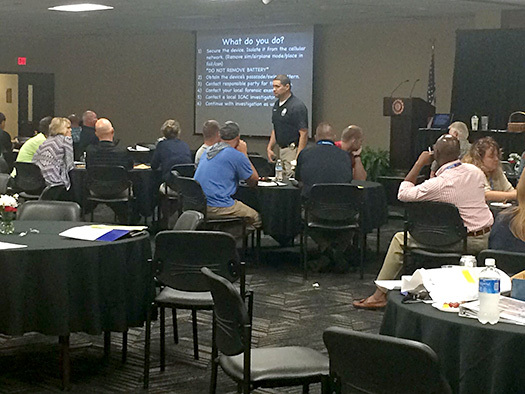 In the spring of 2016, researchers from the Kentucky Center for School Safety (KCSS) conducted a panel study examining the attributes of School Resource Officers throughout the state of Kentucky. Valuable information can be gleaned from within this 29 page report on current trends, practices and funding levels. The KYASRO Regional Map is divided into six regions. These regions are used for training and networking purposes. NEW WEBSITE: The Kentucky Association of School Resource Officers, or KYASRO, is dedicated to the support of SROs throughout the Commonwealth. KYASRO seeks to off a forum for the exchange of knowledge, ideas, and information regarding best practices for School Based Law Enforcement Officers. Kentucky Revised Statute 158.441 requires that the local law enforcement agency and schools have a written contract. A model SRO contract has been developed and can be modified to meet the needs of individual districts and agencies. You may obtain a copy of this template from KCSS. THE IMPORTANCE OF SCHOOL RESOURCE OFFICERS (a brief highlighting the positive impact of SROs authored by The Institute for Preventive Strategies ) School Resource Officers (SRO’s) play a very important role in the safety of our schools. Collaboration between schools and law enforcement is a major step to increasing school security and preventing acts of terrorism or violence within schools. The Institute for Preventive Strategies is a national service of the Center for Rural Development, a not-for-profit organization headquartered in Somerset Kentucky. Model SRO programs across the state that can provide important advice and information for new or fledgling program. The Center has developed a set of standards for SRO programs which can be used to assess the quality of the programs. October is Crime Prevention Month, a perfect time to Celebrate Safe Communities (CSC). Celebrate Safe Communities is a national initiative of the National Crime Prevention Council and the U.S. Department of Justice, Bureau of Justice Assistance, and was developed in partnership with the National Sheriffs’ Association in 2008. CSC is an annual event.